John Maynard, June Rose and Mick Dodson at the Newcastle Yarn Up. The project’s first community Yarn Up was held at the Yamuloong Conference Centre in Newcastle. 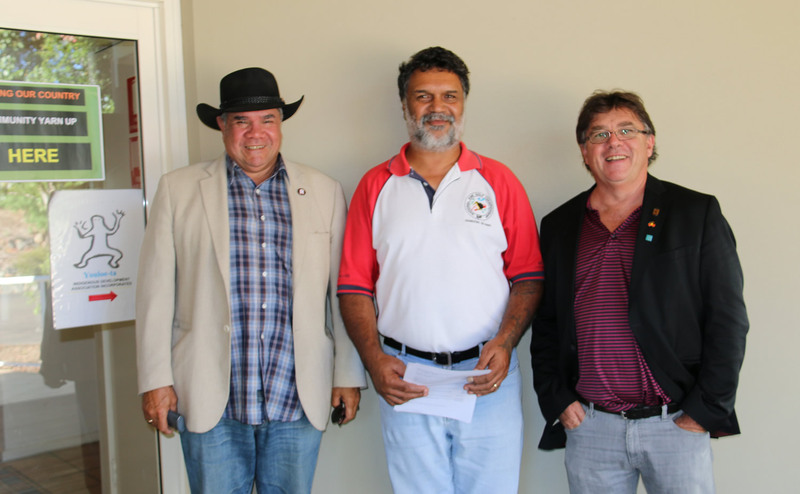 Led by Professor Mick Dodson and Professor John Maynard from the Wollotuka Institute at the University of Newcastle, the Yarn Up gathered momentum through the use of local community contacts. Through the stories we were told by ex-servicemen and relatives, some key themes emerged around returning to civilian life and injuries, families experiences and the career options that opened up for some people who joined the defence forces. Mick Pittman served in the RAAF for 21 years, having joined up as a 17 year old in the late 1960s. Growing up in Casino in NSW, Mick remembers that the brother of one of his mate’s was in the Air Force and Mick thought ‘Here’s a way out’, a way to see the world beyond his hometown. Mick travelled and worked around the world with the RAAF and absolutely loved everything about his time in the service. Relatives we spoke to included Angela Pearce who discussed the service of her great uncle Bert Nixon in the Korean War, and June Rose who discussed her Uncles’ Bill and Joe’s World War 2 service, and in particular their repatriation. We also spoke with John Lester about the World War 2 service of his father Athol Frederick Lester in New Guinea, and his post-war life in Sydney. So too, Leanne Holt talked to us about her grandfather Herbert Arthur Lilley’s service in World War 2, and the World War 1 service of her Great Uncles Albert Lilley Knight and Sidney Lilley Knight, all from the Karuah Mission. Ray Kelly spoke to us about the service of his Uncle and Great Uncle in World War 2, and the great honour in which they are held in his family. Ray also expressed the disconnection and confusion of having pride in service at a time when his family lived on a mission and weren’t allowed to be citizens.Tab Pittman spoke to us about his uncles, Clarence, James and Laurie, who all served in World War 2. Tab expresses great pride in his family’s history of service, and indeed great respect for all who go to war for their country. Laurel Williams also spoke to us about the service of Indigenous men and women from around the NSW Central Coast area, including family and wider community members who have served in all the major conflicts from World War 1 through to Afghanistan. Further interviews have been conducted in and around Newcastle over the life of the project. In September 2014 Hilda Connors spoke to us about her father, Frederick John Blair and his service during World War 2. Hilda believes that Frederick and other aboriginal men were forcibly taken into the army and sent to serve in Turkey. She also discussed the lack of recognition her father and other men received when they returned home. In October 2014 Dawn Conlan spoke to us about her family history of service, including that of her Great Uncle Maurice Wright who served in World War 2 and was held captive as a POW in Changi. In October 2014 we also spoke to Ron Powell who discussed his family’s history of service, including cousin Percy Kennedy Jr who served and died of illness in World War 1 and Ron’s great uncle Sydney Archibald Wilson who served in both World Wars. Stephen Griffin also spoke to us in October 2014 about his father Colin Griffin’s World War 2 service in the Pacific and the harrowing stories of war that his father shared with him. He also spoke about his father’s post war experiences, including mental trauma and the long term effects of the physical wounds he sustained in the war. In October 2014 David Nean also spoke to us about his service in Vietnam in 1967-68 with 7RAR. David decided to join up despite having exemption as both an aboriginal man and a railway worker. David joined 7RAR and remembered doing a great many night ambushes, which he found stressful. He also recounts his experiences with Vietnamese people, Americans and during leave in Hong Kong. David also notes that his father and uncle served in World War 2. In 2010 Dave Cook, a member of the Stolen Generations who served two tours of duty in Vietnam, was interviewed in Newcastle. Quite early on in high school Dave had decided he wanted to join the armed forces, and did so just after leaving school. In the early 1960s Dave was serving in an Army Construction Squad in New Guinea, and around 1965 Dave volunteered to serve in Vietnam and was absolutely shocked at the level of institutional racism he saw there in the US army ranks, but experienced no racism whatsoever with his Australian comrades serving in Vietnam. Leaving the Army in the late 1960s, Dave had a lot of trouble adjusting to domestic civilian life. Image: (l to r) - Mick Dodson, Ray Kelly and John Maynard at the Newcastle Yarn Up. 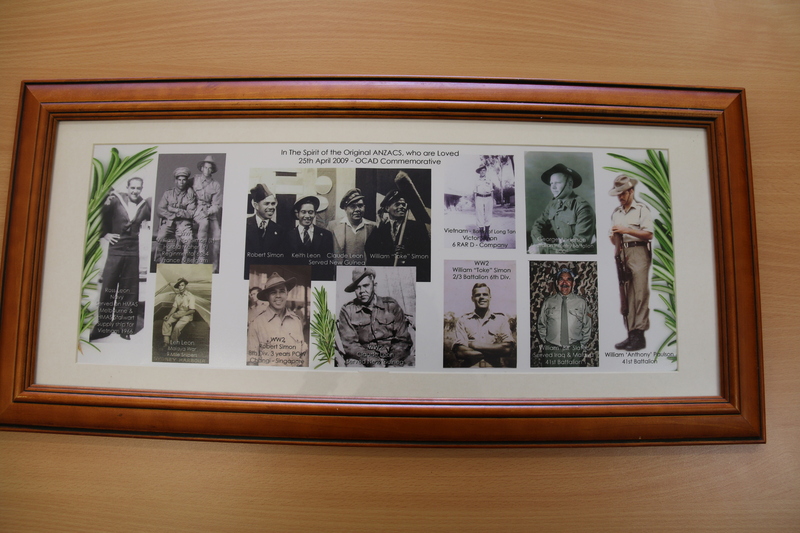 Image: Photo montage held by Laurel Williams, showing members of the Simon, Leon, Paulson, Anderson and Slater families who served. Victor Simon, whom we spoke with in Sydney can also be seen in this photo.